The real trick to Apple Cinnamon is getting the right dried apples. There are lots of choices out there, but we found one that has the right flavor and texture – a dried apple that still has the taste and moisture after it’s been baked. Add cinnamon and you’ve got a classic flavor! Whether it’s for breakfast, a snack at the office, before or after a workout, or any time at all, we know you’ll agree – Four Plus is granola the way you like it! There are lots of choices out there, but we found one that has the right flavor and texture – a dried apple that still has the taste and moisture after it’s been baked. Ready to taste this flavor? Why should I buy Four Plus Granola? People say it’s the best granola they have ever tasted. We use simple recipes, only natural ingredients, made in small batches, baked by hand in our own kitchen. 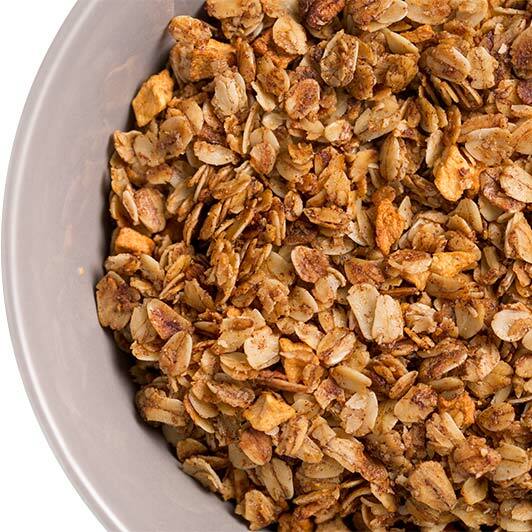 Our granola tastes light, fresh, not too dry, not too crunchy, not too sweet. Yes! Oats are one of the major crops that is not genetically modified. Our canola oil is all natural and non-GMO. Our maple syrup is naturally sourced from trees that are not genetically modified. Honey is a non-GMO food - and our honey is U.S. Grade A. Is Four Plus gluten free? Oats are naturally gluten free. Honey and maple syrup are naturally gluten free. We use all natural, non-GMO, expeller pressed canola oil – naturally gluten free. And all of our added flavors (nuts, dried fruits, and natural flavors) are naturally gluten free. Our products are non-GMO but not organic. We use 100% whole grain rolled oats, pure honey and U.S. Grade A maple syrup. Our canola oil is all natural, non-GMO. Why do you use canola oil? It is considered to be the healthiest of cooking oils because it is lowest in saturated fat. We use natural, non-GMO, expeller pressed canola oil. We prefer expeller pressed oil because it is cold-squeezed out of the plant instead of extracted using heat and solvents. It is more expensive but we think it is much better. Is Four Plus safe for people with nut allergies? We have 3 nut-free flavors but all our products are made in a kitchen that makes flavors with nuts so it is not recommended for people with nut allergies. We make our granola in our own commercial kitchen in South Norwalk, Connecticut. All of our flavors are between 130 and 150 calories per serving, depending on the flavor. In the flavors with nuts, a big portion of calories come from the healthy fat in nuts. Four Plus Granola is one of the lowest in sugar, meaning its calories come mainly from the healthier carbohydrates and nut fats. Four Plus is naturally sweetened with honey and maple syrup, but the dried fruits (cherries and cranberries) have a little added sugar… and of course the chocolate in our Cherry Chocolate has sugar. We do not add any cane sugar, brown sugar or sweeteners other than honey and maple syrup. Our flavors range from 2 to 5 grams of sugar per serving. We are not aware of any other granola that is lower in sugar than Four Plus.